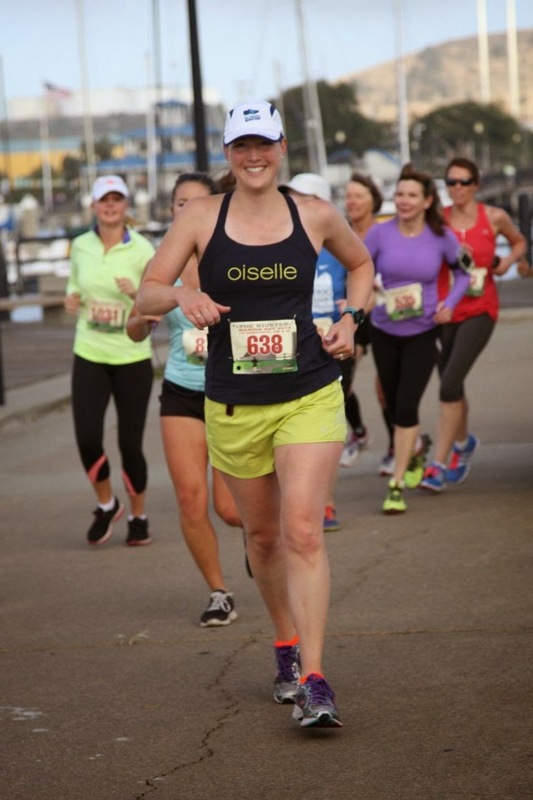 The Marina Bay half marathon was an inaugural event with a Rosie the Riveter theme, and it was staged at the Rosie the Riveter World War II Home Front National Historical Park in Richmond, CA. I've never thought of Richmond as a scenic place to run, but I was pleasantly surprised with this course. It started on a road around the park buildings but quickly turned onto the Marina Bay paved trail and stayed on water-side trails for almost the entire time. Because it was such a small event (575 people in the half), there were no problems with crowding on the trails at all. The start time was an early 7 am so Kevin and I stayed nearby with friends on Saturday night. We picked up our race packets the morning of the race; they had pick-up from 5:30 to 6:30 am. There was no expo, but you could also pick up packets at running stores in that area and in SF the day before. Parking near the race was super easy either on the street or $10 to park right at the start area. Very convenient and worth the $10 to me. 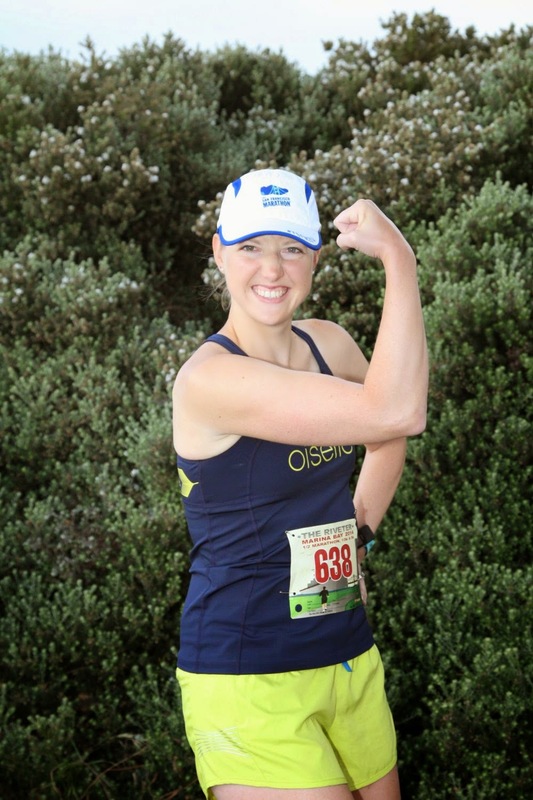 Getting pumped up pre-race with 'The Riveter' pose. I wasn't going for the half PR yet, but I wanted to run a solid and consistent half and that I did. I'm happy with my splits and how I felt throughout the race, finishing with a 2:05:19. Kevin, on the other hand, went out for the PR and nailed his first sub-1:40 with a 1:37. I don't know how he PRs so much but I'm proud of him! I can't say I have detailed thoughts from during the race. I enjoyed running along the water and having a couple of out-and-back sections to see the winners (and Kevin) go by. I met a couple of new people at the start and also my Twitter buddy Christina in person for the first time while running; we all cheered for each other when we passed for a nice little boost. 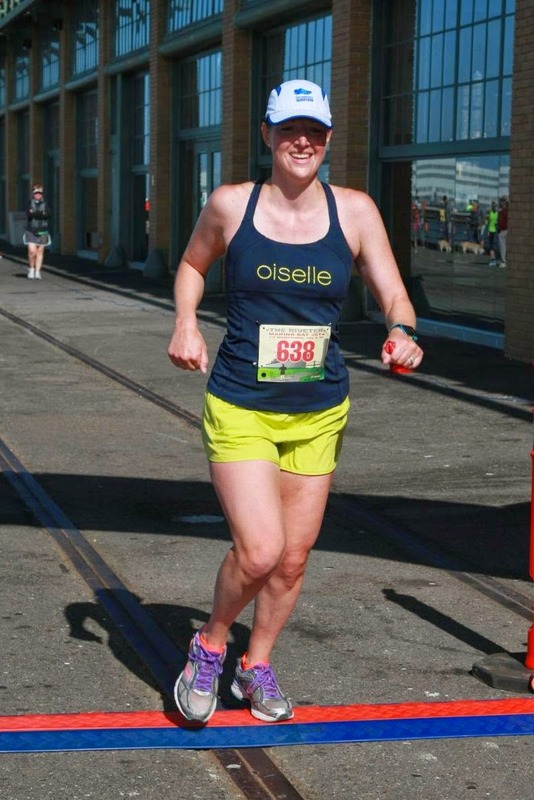 I made sure to enjoy the SF skyline and other views as we ran by, and there were plenty of those opportunities. The only weird part was running through a huge dog park at one point, which confused both the runners and the dogs. That said, I was entertained and talked to some dogs. Happy runner, very early on in the race. We looped back around to finish where we started and Kev was there to tell me to push it when I was closer to the finish than I thought. I finished feeling strong and realizing I could have given more, but again that wasn't the goal for the day. It was just a tune-up on the distance and a chance to check out a new place to run. On the bright side, I passed a lot of people in the last few miles and that felt great. Celebrating with very large medals. The support. There are some hiccups with any new event, but they did a really great job overall. The water stations didn't have a ton of volunteers so I waited for water a couple of times; on a PR day that would have frustrated me, but it was ok and I probably didn't lose more than a minute total. There were plenty of park restrooms along the trail so they didn't put out extra porta-potties. Course marshals were plentiful and kept us following the correct route plus cheered us on. They had both water and sports drink at the aid stations, plus about 2 (maybe 3) opportunities for gels and one station with oranges. The course. I already talked about the course a lot but here's the quick recap: lots of water-side running, nice views, super flat and paved trail. It was very easy to get there in the morning and to leave the area after. They also had a 5K and 10K that started at 7:30 am (30 minutes after the half start.) I saw only a few 10K runners on the course but no 5K runners, which tells me the logistics for not crowding the trails worked well. The finish line. This was the other hiccup. There was no water immediately at the finish line (unless you had a hubby bring you one like I did, thanks Kev.) Otherwise you had to go back into the building to track it down, and it looked like the 5K and 10K runners cleaned a lot of the finish food out before half marathoners got there. When it was there, they had Hint water, bagels, fruit, Pop chips, fancy popcorn, and red vines. The race director sent a follow-up email after the race saying many of their tables for the finish didn't arrive due to a truck breakdown, and I imagine they'll fix all of this up the next time around. The swag. The shirts are pretty busy and not my favorite, although they are pretty comfortable. The medals are huge and nice, and the bibs themselves were really cute. That's it - happy running! Sounds like you had a great run!! You look so happy in all your photos! Great job Paulette! I'm with you on the shirt. That is very busy. Sounds like a great run :) Still pretty darn speedy I think! Was that Point Isabel dog park you ran through?